Being organized is NOT one of my biggest strengths. However, I have been trying to get my life organized this year and I actually had a lot of success when I tried to organize my closet. It may seem like such a trivial thing but it really helps to see everything and know where it is, in a nice and organized manner. I’m not the most handy or crafty person, but these little tricks and hacks were so simple, that even I could do it, so I’m sharing them and hopefully it’ll help you out a little when you try to Organize Your Closet. Over the years, I’ve managed to collect a few (ehm) purses. I’d stash them in one side of the closet and try to keep them organized between everyday, extra large, computer and dressy. It wasn’t the best way but I didn’t really know what else to do until recently. I discovered a way to repurpos an over-the-door coat hanger with multiple hooks that I have in the house. 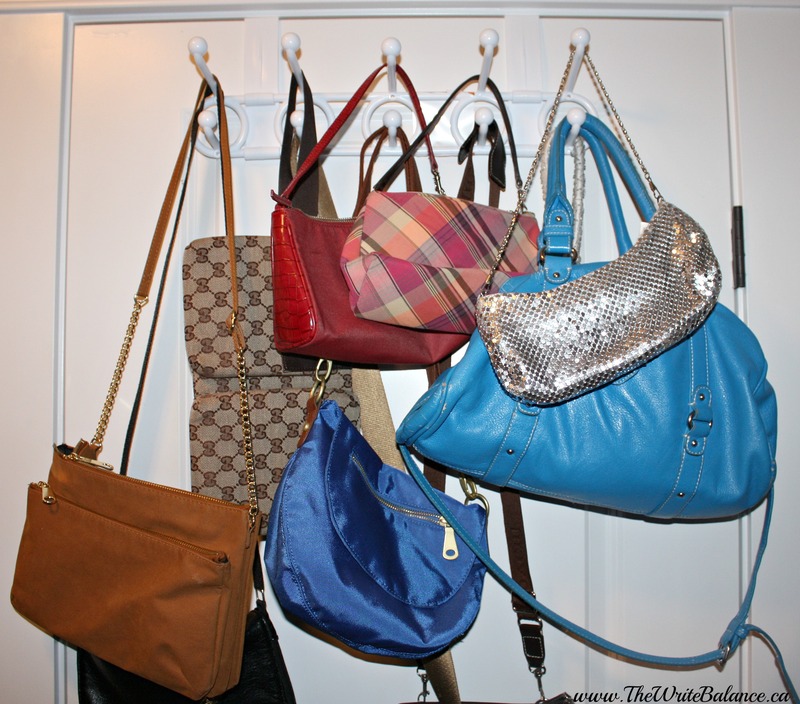 This is great tool to organize your closet because it’s inexpensive, holds a lot of bags, keeps them off the floor and it’s easy to see and choose the one you want to use. Last season, I went a little nuts over scarves, especially when I figured out a super easy way to make DIY Infinity Scarves. They are are a simple and inexpensive way to accessorize and change your everyday outfit. I used to just keep all the scarves in a basket on the floor of my closet. But it was hard to see all the options and they would end up in a tangle. So I took a strong hanger and a pack of sturdy shower curtain rings and made myself a scarf organizer. Just put the rings on the hanger and then pull the scarves through, it’s that easy! A while back I bought my hubby a special hanger that’s used to hang ties. 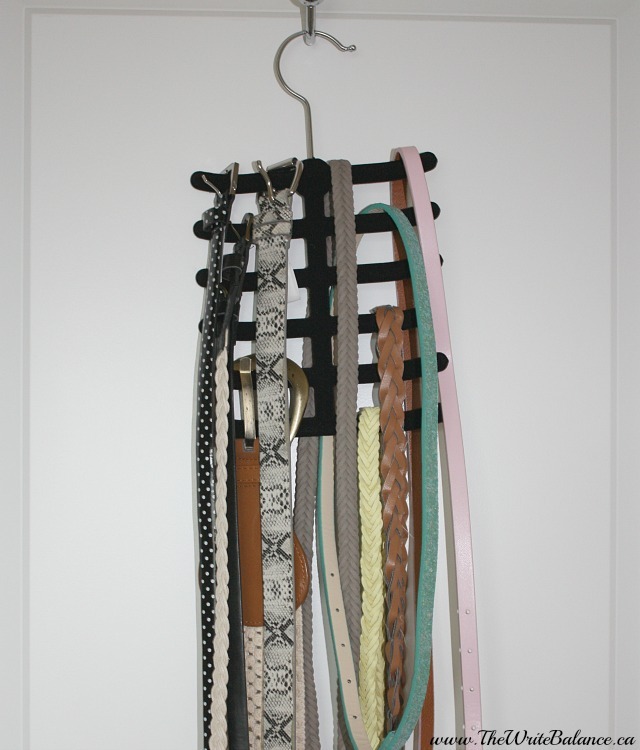 But he never used it, so instead I took it and repurposed it to hang my belts. They stay untangled, organized and easily accessible. I found this one at Target. Jewelry’s always been a difficult one for me to keep organized. The pairs get mixed up, the necklaces get tangled and they all end up in a mess in my jewellery drawer. 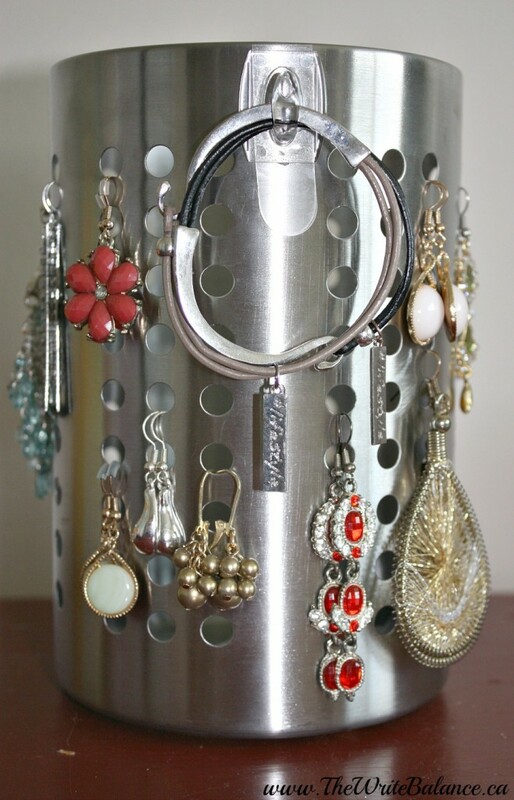 I found this pretty awesome DIY jewelry holder using an IKEA utensil holder from My Sister’s Suitcase. I love how this displays all my earrings so beautifully and how easy it is for me (or my daughter) to pick the earrings I want to wear. I’ve also got a small collection of stud earrings and a few rings. I found an awesome little organizer at the local Dollarama and it was perfect. You can find it in the craft section and in the hardware section. It makes it so easy to find and store everything. I also bought an extra one to take with me for travelling because you can adjust the sizes of all the squares and fit all the jewelry you want to take in one little organized box. And it only costs $1.25. Those are 5 easy hacks to help organize your closet that are making my life just a little more organized. What are your little secrets for organization? PS. 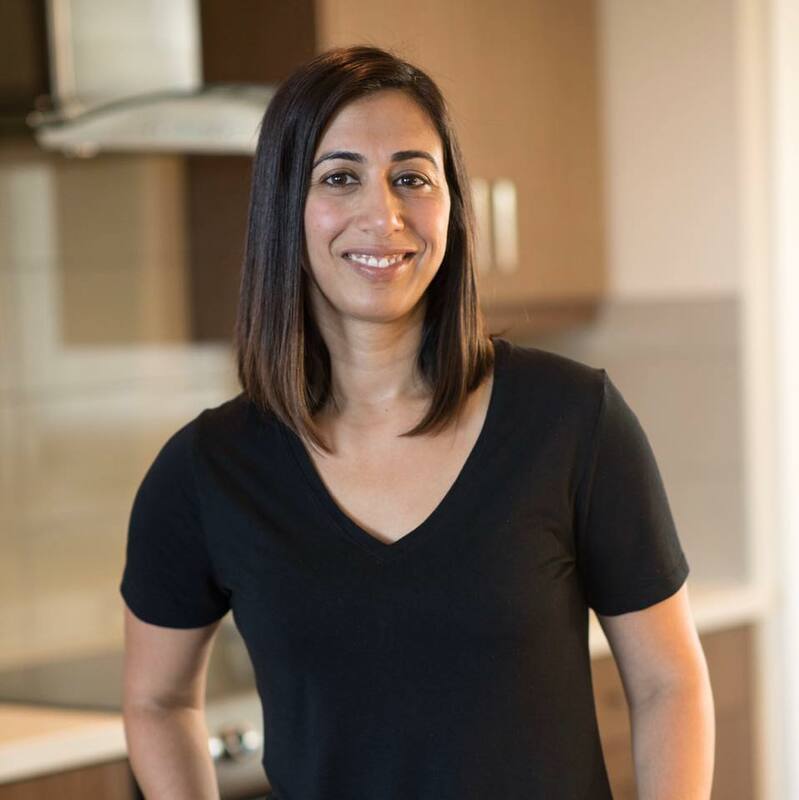 If you love organization hacks, check out this one with 4 simple hacks to help organize the house! Oh I love the scarf idea! 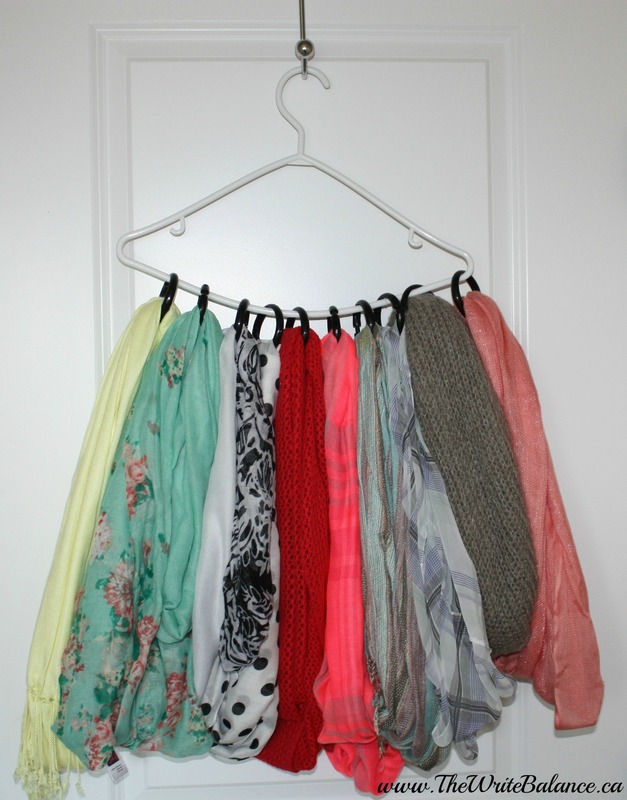 The tie hanger is also great for scarves! I got a funky hanger covered in circles from Target that I use for my million scarves. Love these ideas. Yes, I’ve seen those hangers Tamara, totally perfect for scarves too! Thanks Priya. 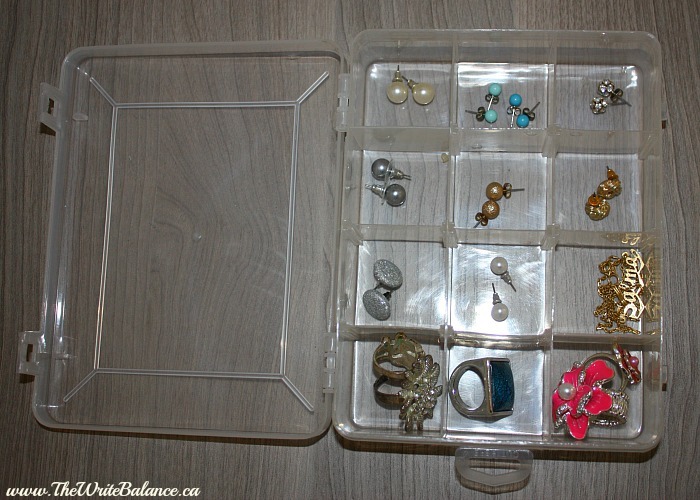 Hopefully you can find a similar box where you live to get your jewelry organized. Great tips. I do the exact same with scarves and belts. I don’t have enough earrings to get anything for them. They fit nicely in my jewellery box. I don’t have many handbags either. That looks so organized! My wife needs to learn these tricks, she just piles her stuff on the bathroom countertop! You should surprise her and get some of those things and help her get organized Scott. I’m sure she would love it! These little tips help the closet stay a little more organized, thanks! I love the Ikea utensil container as a holder. It’s so inexpensive yet effective! 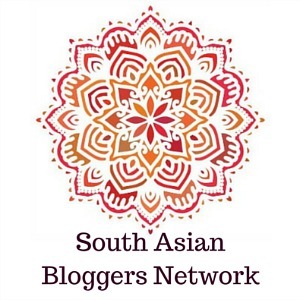 love these ideas…. as an org junkie myself, i have a scarf hanger and that same dollar store container for my jewelry— especially great for travelling! OMG I totally love the idea with the Ike cutlery stand! I’m inspired to clean up my closet now. Jewelry is so hard to organize for me. I love the idea of separating the earrings into compartments! I can instantly fall in love with every organization tip. Will share my closet organizing tips too.